Egypt | Salam, Big World! 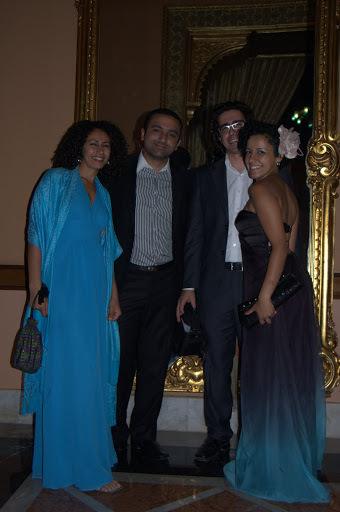 I decided to go on a last minute trip to Egypt to attend one of my childhood friend’s wedding. I bought my ticket on Tuesday night and flew out Wednesday morning to attend the wedding that evening. 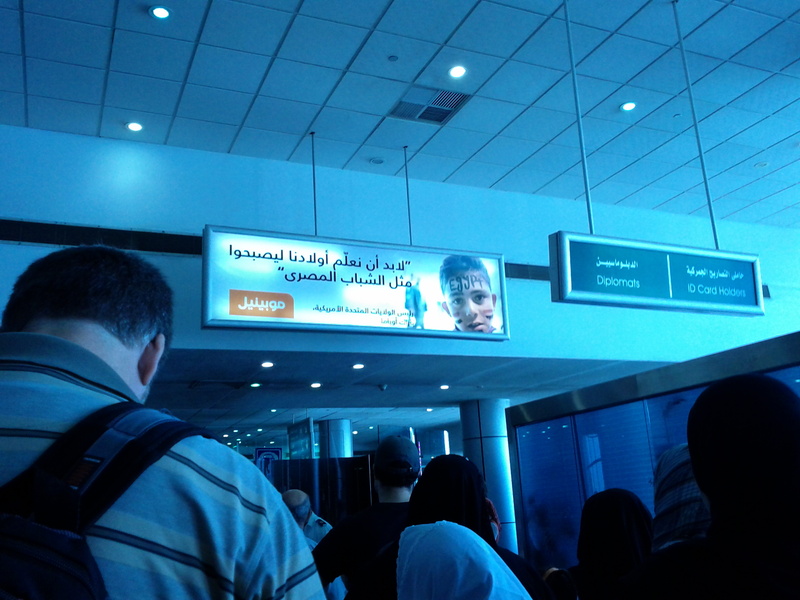 Last time I was in Egypt was in February during the revolution and the fall of Mubarak. So, as soon as the plane landed in Cairo – I was eager to see what the country is like now that it’s been 5 months since the fall of the old regime. The first sign of post-revolution change I saw was an ad for Mobinil using the Youth Revolution to advertise its service. An Ad Age Global article explores all the different ways Egyptian marketeers are using the revolution to market their products and services. Later that day, I saw an ad for butter that used the revolution in their marketing slogans. Although this could have a positive impact on responsible consumerism, since all companies are trying to focus on the positive values and characteristics of the Egyptian Revolution – I still think this could easily turn into a case of Pink Washing of the revolution. On a more uplifting and personal note, I was so happy to be back in Cairo to attend my friends’ Menna-and-Ali’s wedding on Wednesday. And I was so happy to top off my quick trip to Egypt by a quick visit to the Mediterranean North Coast. The day my last blog post was published, the plane I was on, landed in the Cairo International Airport a little after 9pm on Thursday. 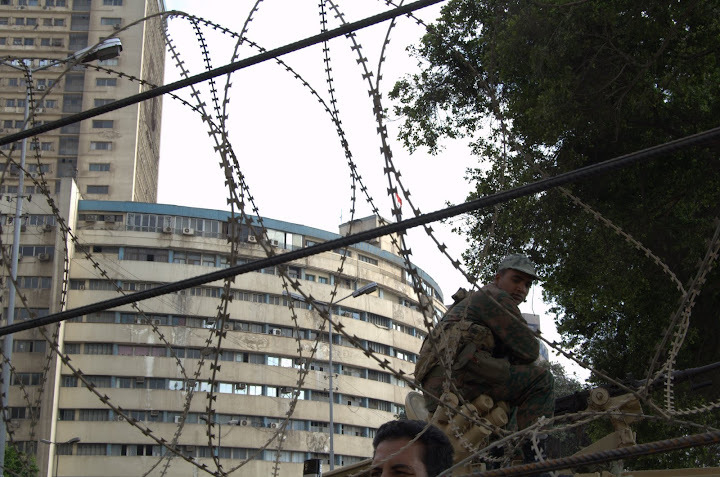 Despite the crispy cool weather, tension was high in the air in Cairo. As I listened to the disappointing speech of the former Egyptian president Hosni Mubarak in the car with my mother and a friend I met on the plane, I started thinking about how much longer this was going to take, how many more lives would have to be lost, how many businesses and schools would have to remain closed, and how much longer the world was going to pay attention to what was going on in Egypt. After holding a democratic vote with a group of friends we decided to head to the State Television building. State-controlled television had launched a campaign propaganda misinforming the public about the numbers of protesters and launching and anti-revolution campaign with famous actors and public figures. A group of us jumped in a car and immediately drove to Tahrir Square. There are very few words that can explain how I felt at that exact moment. Seeing so many people out on the streets of Cairo waving the Egyptians flags high in the sky, singing cheerful and nationalistic chants and songs and children dancing on the streets was a sight I did not predict in a million years. We entered the busy Tahrir Square and I immediately felt the change. This was not just the fall of a corrupt dictator and his regime; this was the uprising of a people who have been silenced and ignored for 30 years. Growing up in Egypt as a woman, I always avoided crowded spaces for fear of sexual harassment, a growing problem across the country. A problem that has not been fully addressed in Egypt and in the media. But this time, I felt different. I felt like I could walk the streets of Cairo as a woman and nothing would happen to me. It was because we were all connected. We were all connected to the spirit of change and the soul of Egypt. Throughout the whole uprising, we all wanted the same thing. We all wanted freedom and democracy. It is not to say that Egypt’s movement for democracy has not been impacted by gender violence, the report that Lara Logan, a CBS reporter, was sexually assaulted while reporting in Cairo on the evening of February 11, the night Mubarak stepped down has not been forgotten. My friends and I were horrified when that story broke. Some of us were even disappointed that it took a non-Egyptian woman’s painful story to shed light on an issue many of us were too familiar with. I have high hopes that in this new democratic Egypt, the issues of gender violence against women will be addressed. I believe that the new Egypt will work on protecting and serving ALL of our citizens, not just the rich and male. The next morning young Egyptians all over the Cairo took to the streets with broomsticks and trash-bags and cleaned the city. It was magical to see the usually littered streets of Downtown Cairo spotless. As a friend put it: “We overthrow a dictator by night and clean our city streets by day!” Egyptians all over the city were cleaning streets, directing traffic, forming groups to help Egypt’s transitional period…Long live the Do-It-Yourself Revolution! On International Women’s Day, March 8, thousands of women took to the streets of Cairo and gathered in Tahrir Square to celebrate their achievements as part of the #Jan25 revolution and to voice their demands in a democratic Egypt. Unfortunately, the peaceful demonstrators were met were met by violence when men started to verbally abuse and shove the women, telling them that they should go home where they belong. 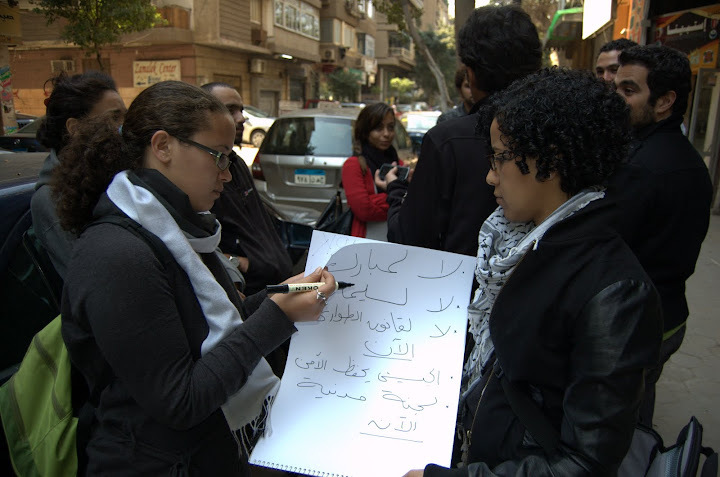 Women were a major force in the Egyptian revolution as they are in everyday Egyptian society. I believe that for a nation to advance, the rights of all its citizens should be preserved and respected by the law. While it might be a steep hill climb to equality, I believe that once reached the views will be breathtaking. Original Blog Post on Asian Communities for Reproductive Justice Blog. During the past 14 days, of what the media has dubbed as “Egypt’s unrest”, I have been going through a bag of mixed emotions from extreme happiness to extreme sadness. I was happy to see my friends and family members rush the streets of Cairo in a sense of unity I have never witnessed or experienced myself in my own country to feeling sadness that hurts beyond any words can fairly describe, when watching young Egyptians die at the hands of the government that has so stubbornly and ruthlessly ruled our country for 30 years.During the past 14 days, I listened to my mother cry on the phone in our home in Cairo. I have talked to friends during the internet blackout who asked me if the world knew what was going on. I watched a friend and colleague vanish and return to bring a new voice and renewed hope to the people. I protested in solidarity with the people in Egypt on the streets of San Francisco and chanted so hard I lost my voice. During the past 14 days, I felt things I wasn’t sure one could feel for a country, for a place, for 80 million faces I’m not familiar with…but I did. Many things about this revolution have shocked the world and the Western media, in particular, regarding Egyptian and Arab stereotypes. The world got to see first hand that our people want basic human rights, that they are not religious extremists hoping to follow in Iran’s footsteps, and that we have a strong female representation and that the women of Egypt have a voice as loud as that of their male counterparts. When police violence broke out against the peaceful protesters the corrupt Egyptian police forces disappeared from Egypt’s streets over night. There was no official protection for the people. Egyptians in every neighborhood, every apartment building, every community built neighborhood watches. During the past 14 days, I have felt a lot of regret for not getting on a flight on January 26, but today I have decided I’m not going to let the feelings of regret paralyze me. I have booked a flight to go back home to do whatever I can to help my country during those hard times. I’m prepared to do whatever I can to show the world that this is not an “unrest” this is a revolution…our revolution…my revolution!